Share stories about your animal by completing our form. Tell us about them and add a picture, they are worth a thousand words. It will be posted on the site for everyone to see. Click here. If you have information on your organization, business, blog, etc. please send it to us so that we can add it to our resource list. Give us a little information so that people will know what you are all about. See our list of resources. Go to the top of this page, "Resources/ Organizations"
Would you and your family like to really get away this summer? How about becoming one with nature again, if you could sleep in a comfortable bed and take a nice hot shower? There is a place like that in the North Carolina Mountains. It is called Clear Creek Ranch. 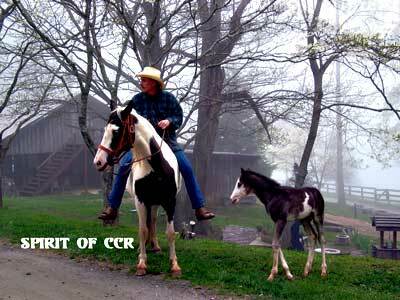 Nestled in a quiet valley in the Great Smoky Mountains at an elevation of 3,200 feet, Clear Creek Dude Ranch is surrounded by the beautiful Pisgah National Forest. They welcome guests from April to Thanksgiving. Some of the activities you will enjoy are horseback riding, camp fires, golf, fishing, hiking, swimming and many more. It is owned by some wonderful friends of mine, Rex and Aileen Frederick. Rex was a great basketball star at Auburn University. He became only the 3rd Auburn Tiger to have his jersey (#32) retired. Rex is in the Auburn Hall of Fame. Rex and his wife, Aileen, have always had a passion for animals, especially horses. They decided to buy a dude ranch. It has been a wonderful experience for them but it is time for them to move on. They are at that age where they want to travel and enjoy other things life has to offer. They have been running this ranch 24/7 for many years. It is not as easy, and glamorous, as you might think. Can you imagine having to get up at the crack of dawn to meet your guests as they arrive for breakfast every morning? Then organize the activities, make sure everyone is having fun, oversee the business of the ranch, etc. At the end of the night making sure you are still awake to tell your guests, having a nightcap in the Cantina, good night before turning in? Talk about a long day, everyday. They have wonderful staff that come back year after year because of the way they are treated. Even in the winter, when it is closed to the public, they need to care for all of the horses and other animals, as well as continue to run the ranch. I hope you will visit Rex and Aileen before they sell this beautiful ranch. If you go, tell them I said hi. If you, or someone you know, has interest in buying this ranch, please let me know. I’m selling the ranch for them. Please enjoy this video of the ranch. What a nice ranch. I always see them in the movies and I always dream of having one. Copyright © 2009 ANIMAL CONNECTION. All Rights Reserved. Designed by Autoresponders and Reverse Cell Phone.